It is cold. I mean really cold. 23.2 degrees Fahrenheit without wind chill; 15 degrees with it. I know that there have been even colder temps during winters here in recent memory. If it seems particularly bitter at the moment, it’s only because thermometer readings of the preceding week were those you would find on a moderately brisk day in Boca Raton. At its best, New York’s temperature is variable. The Wikipedia entry for “Geography of New York City” says that NYC, although located on the coast of a Mid-Atlantic state, is characterized as having a “humid subtropical climate.” While winters are cold, temperatures don’t get low enough for “persistent snow cover at Central Park.” Data from The National Oceanic and Atmospheric administration (NOAA) indicate that temperatures below zero turn up only sporadically each decade. The City can be brought to a halt by storms dropping a foot of snow. These, however, are few and freakish. The first oriole had already been spied hanging its nest from a cedar in Central Park… The first straw hats had made their appearance, and the streets of New York were gay with Easter attire, when, on opening its eyes [on March 13] the city found itself silent, deserted, shrouded, buried under the snow. . . .
At no time in this century has New York experienced a storm like that…. It had rained the preceding Sunday, and the writer working into the dawn, the newspaper vendor at the railroad station, the milkman on his round of the sleeping houses, could hear the whiplash of the wind that had descended on the city against the chimneys, against walls and roofs, as it vented its fury on slate and mortar, shattered windows, demolished porches, clutched and uprooted trees, and howled, as though ambushed, as it fled down the narrow streets. Electric wires, snapping under its impact, sputtered and died. Telegraph lines, which had withstood so many storms, were wrenched from their posts. . . .
A messenger boy, as blue as his uniform, was dug out of a white, cool tomb, a fit resting place for his innocent soul, and lifted up in the compassionate arms of his comrades. Without milk, without coal, without mail, without newspapers, without streetcars, without telephone, without telegraph, the city arose today. What eagerness on the part of those living uptown to read the newspapers, which thanks to the intrepidity of the poor newsboys, finally came up from the downtown presses! There were four theatres open last night, but all the stores and offices are closed, and the elevated struggles in vain to carry the unwitting crowds that gather at its station to their places of work. The storm left drifts as high as fifty feet. Four hundred people died on the Eastern Seaboard. Two hundred in New York City alone. The photo above shows the maze of telegraph, telephone and electrical wires dangling from their poles. 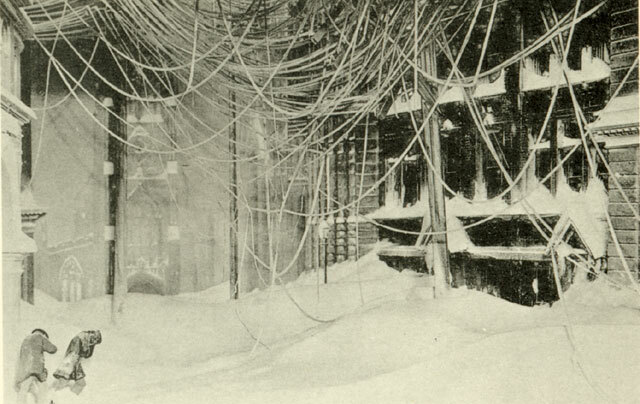 Before the blizzard, all such wires were strung over the streets, but fallen, they created such a deadly hazard that the city mandated their reinstallation underground. This week sleighs have crossed over the ice from Staten Island to this city, which has hardly been known before. The Upper Bay froze solid enough to support a sleigh drawn by horses? As in clop, clop, clop? How cold would it have to be to freeze the surface of a body of water 50 feet deep, especially one that for half of each day runs salt water from in-coming and out-going oceanic tides? The Lower Hudson, at a depth of a little over thirty feet, would also have frozen. There seems to be a theory afloat that the more impurities water contains, the faster it freezes. Impure water will generally freeze at 32 degrees F or, if it very pure, stay in liquid form until minus 55 degrees F. Impurities in the Hudson? We might be on to something. Was the Hudson filled with more impurities in 1780 than now; hence likely to freeze at a higher temp? This bears further investigation. According to the New York Times Archive, February 2, 2003, it is more likely for the East River to freeze because it is shallower than the Hudson. That happened in January of 1866-67, bringing ferry service to a standstill. Also briefly during the great blizzard of 1888. On those occasions, some crossed the river on foot, but no mention of sleighs.